Unused animation of the ship doing a barrel roll. 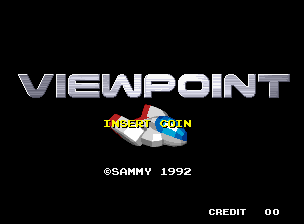 Once outside the Neo-Geo BIOS, press both the 1P Start and Next Game buttons (in MAME, 1 and 3, respectively, by default) OR both the 2P Start and Previous Game (in MAME, 2 and 4, respectively, by default) buttons simultaneously. If done right, you should see PAUSE on the upper right corner of the screen and the game will pause. This will disappear and the game will resume if you press the buttons again. While PAUSE is shown, press both Up and Down at the same time to open a debug menu. The debug menu will be shown on the upper left corner of the screen and will not have a border. 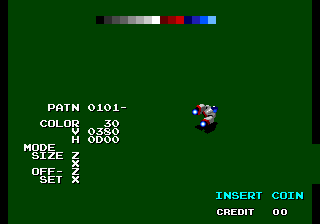 Note that the PAUSE and Debug Menu features are a bit wonky when used outside gameplay (and some features outright don't work outside gameplay). Press Button 2 to exit this menu. Warning: if you try to unpause the game before exiting the menu, nothing will happen until you exit the menu, which will both exit the menu and unpause the game, possibly resulting in the game registering Button 2 to launch one of your special attacks! Press Button 1 to reset the Neo Geo. Note that the sound driver may not reset properly, so background music may continue to play, or may be glitched. This should fix itself once the Neo Geo sound plays. This is a toggle option; pressing Button 1 will switch this between ACTIVE and OFF. ACTIVE is the default. When OFF, you are invincible. 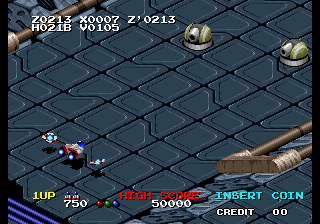 Can you also destroy some enemies by simply running into them, or running into them with a charging beam? This is a toggle option; pressing Button 1 will switch this between OFF and ON. OFF is the default. The effect when ON is unknown. When ON, information about the current scroll position will be shown on the top-left corner of the screen. Note: if you turn SCROLL off, the numbers will stay on screen until the next time the screen goes black. When ON, information presumably about current objects will be shown on the first line of the HUD at the bottom of the screen. Note: if you turn OBJ MSG off, the numbers will stay on screen until the next time the HUD is redrawn as a whole. 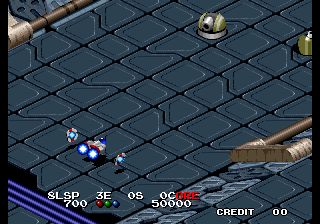 When ON, information about the player's current position and state will be shown at the bottom-right corner of the screen, above the HUD. Unlike the SCROLL and OBJ MSG options, the information here is more clearly labelled. Note: if you turn PLAYER off, the numbers will stay on screen until the next time the screen goes black. Decipher these values anyway. Note: SHOT COUNT is actually the strength of the currently charging shot's charge. This option is a screen which allows you to play with object sprites and the FIX layer tiles. Press Button 1 to enter it. Once entered, there is no way out but to reset the game. You can even pause, unpause, and enter the debug menu from here! Whatever music was playing will continue to play. The VIEW OBJ screen has two modes, SPRITE and FIX. Button 4 allows you to switch between the two through a menu. VIEW OBJ initially opens in SPRITE mode. This is an object sprite viewer. There are several items here; you can navigate between them with Up and Down. PATN chooses the object and sprite to view. The two hexadecimal digits on the left is the object number; the two on the right the right are the sprite number within that object. Press Button 1 to begin changing the numbers. The cursor will move under the sprite number; use Up and Down to alter the current number and Left and Right to switch between the two numbers. Press Button 1 to stop changing the numbers. COLOR allows you to choose a palette line to draw the sprite with. Hold Button 1 down and use Up and Down to select a palette line number. Release Button 1 when done. While Button 1 is held, the cursor will change to <. The colors of the current palette line is shown at the top of the screen. 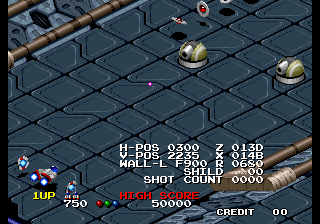 V and H (which are treated as a single item) control the position of the sprite on screen. Hold Button 1 and use the joystick to move the sprite. Release Button 1 when done. You can also hold Button 2 to perform V/H movement regardless of which item you have the cursor on. The MODE, SIZE, and OFFSET items are hidden by default. Press Button 3 to toggle them visible and invisible. Not all of these apply to all objects; only the ones relevant to the current object will be shown. However, you cannot move the cursor onto MODE at all. Furthermore, while you can move the cursor to the individual components of SIZE and OFFSET and hold Button 1 to appear as if you are editing those values, moving the joystick has no effect and the values will stay as they are. Specifically: What's up with MODE, SIZE, and OFFSET? What do MODE, SIZE, and OFFSET represent? 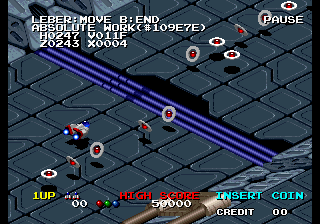 This screen allows you to view the tiles used by the Neo Geo's FIX graphics layer (the non-scrolling layer usually used for text). Tile banks are shown in pairs using a palette line shown at the top. 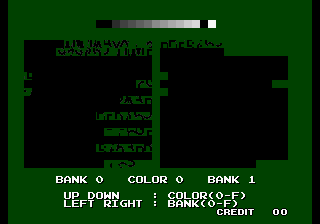 The controls are explained on screen: Up and Down change the palette line and Left and Right change the shown tile banks. Buttons 1, 2, and 3 do nothing. This allows you to manipulate the objects currently on screen around. Press Button 1 to get to the main screen. Use Up and Down to select an object to move. The currently selected object will flash. Press Button 2 to go back to the debug menu. 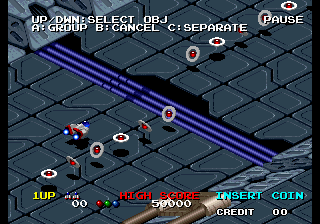 Some large objects are made up of multiple sprites. In this case, each individual sprite is a separate selection. This is where the difference between "group" and "separate" comes into play. You can choose to either move the object as a whole (the "group") or just the currently selected sprite (the "separate"). Pressing Button 1 edits the group; pressing Button 3 edits the separate sprite. Regardless of which you choose, you are taken here. Use the joystick to move the object/sprite. Some information about the current object/sprite will also be shown on the top-left corner of the screen. Once you are done, press Button 2 to return to the main OBJ POS screen. This screen also shows the current sprite position and the location of its data in memory. Note that changes made to groups will be applied once you unpause, but changes made to separates may or may not be applied, depending on the nature of the object changed. This provides demo recording and playback functionality. Press Button 1. The cursor should change to a > and you should be able to use Up and Down to choose between NONE, REPLAY, and RECORD. Press Button 1 again to confirm. NONE is the default. Press Button 2 to cancel. Setting changes only take effect when starting a new stage. They do not take effect when dying or continuing. 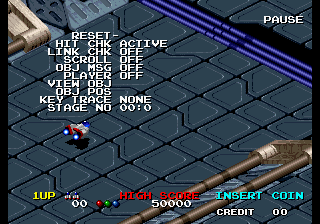 Therefore, you must change a setting on the title screen or How to Play screen (for recording/replaying the first stage), or before clearing a stage (for recording/replaying the next one). Unfortunately, choosing RECORD will have no real effect because as programmed, the game will try to overwrite ROM with your recorded values. Re-find out out where in ROM this is, where in ROM this address is, and figure out what free memory I can use instead. Memory card? Use REPLAY to play back the recorded demo. As mentioned earlier, since this data is being pooled from ROM, the data it's reading happens to be garbage that can't actually play the game. This is a simple stage select. You can choose both the stage to start at and the checkpoint within that stage to start at. Press Button 1. The cursor should change to a >. Up and Down change the stage number (to the left of the :). Left and Right change the checkpoint number (to the right of the :). Press Button 1 again to confirm. 00:0 is the default. Press Button 2 to cancel. Setting changes only take effect when starting a new game. They do not take effect when dying or continuing, or even when clearing a stage. Therefore, you must change a setting on the title screen or How to Play screen. 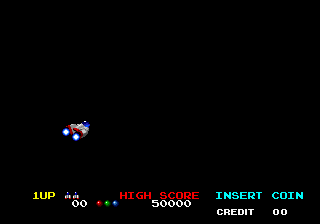 Stage 00 is the normal game; it starts you off at the intro. It has no checkpoints. 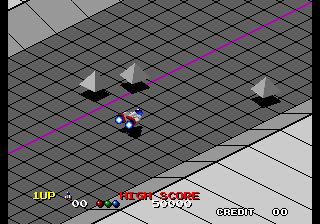 Stages 01 through 06 are the normal levels; they have varying numbers of checkpoints. The remaining stages all have no checkpoints. Stage 07 is a playable version of the "stage" for the intro; that is, you will be taken to an empty stage that scrolls at the usual speed and have full control of the ship. You can even collide with the walls (even in the part when you're in the sky!). There is no background music. Wait a minute, isn't the art different here? Not just the missing launch pad, but the entire floor and walls? Also the part without the sky is shorter? Stage 08 is the ending, and this time the ending will actually be shown (you cannot play the ending stage like normal stages as with stage 07). Stages 09 through 1F are test stages described below. Does stage 07 ever end? You can enter these stages using the stage selected mentioned above. Each of these stages have no checkpoints. None of these stages play any background music. Do these stages ever end? 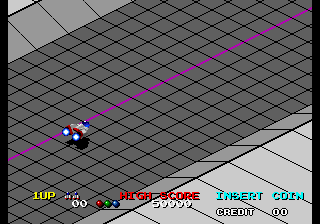 This stage has a simple geometric tiled floor with a colored line going through the middle and has no background music. Occasionally an indestructible spinning triangle will come on screen and follow you, so over time the number of spinning triangles increases. Though you cannot destroy these triangles, they can destroy you. Like Stage 09, but this time, there are no objects. Like Stage 0A, but completely black (no art). There is still a wall to collide with. This page was last modified on 14 May 2018, at 07:54.